Sydney is known for nightlife, trails, beaches, parks, and museums. 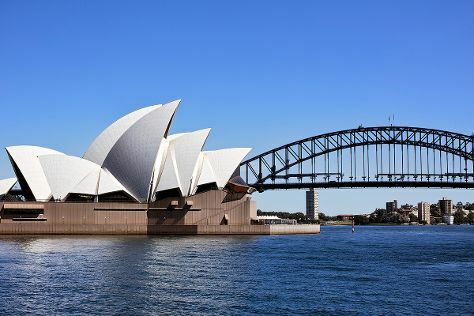 Your plan includes some of its best attractions: admire the striking features of Sydney Opera House, stroll through Manly Beach, examine the collection at Australian National Maritime Museum, and take a stroll through The Rocks. To see reviews, more things to do, traveler tips, and tourist information, you can read our Sydney tour itinerary builder site . San Francisco, USA to Sydney is an approximately 17-hour flight. You can also do a combination of train and flight; or do a combination of bus, shuttle, and flight. The time zone difference when traveling from San Francisco to Sydney is 18 hours. When traveling from San Francisco in September, plan for slightly colder days in Sydney, with highs around 71°F, while nights are about the same with lows around 54°F. Cap off your sightseeing on the 2nd (Wed) early enough to travel to Melbourne. Melbourne is known for museums, shopping, parks, nightlife, and zoos & aquariums. Your plan includes some of its best attractions: take in nature's colorful creations at Royal Botanic Gardens, get lost in a book at State Library of Victoria, see the interesting displays at Melbourne Museum, and enjoy breathtaking views from Eureka Skydeck 88. Fly from Sydney to Melbourne in 3.5 hours. Alternatively, you can do a combination of flight and shuttle; or drive. Traveling from Sydney in October, things will get slightly colder in Melbourne: highs are around 69°F and lows about 47°F. Wrap up your sightseeing on the 5th (Sat) to allow time to travel to Cairns. Change things up with these side-trips from Cairns: Palm Cove (Hartley's Crocodile Adventures & Palm Cove Beach) and Port Douglas (Scuba & Snorkeling, Safaris, & more). Spend the 10th (Thu) wandering through the wild on a nature and wildlife tour. There's still lots to do: stroll through Esplanade Boardwalk, indulge in some personalized pampering at some of the best spas, have fun at Esplanade Lagoon Pool, and take an unforgettable tour with a helicopter tour. For reviews, more things to do, photos, and tourist information, go to the Cairns trip planner . Fly from Melbourne to Cairns in 6 hours. Alternatively, you can drive; or take a train. Traveling from Melbourne in October, expect nights in Cairns to be much warmer, around 69°F, while days are a bit warmer, around 85°F. Finish your sightseeing early on the 12th (Sat) to allow enough time to travel back home.